Glial cells are also present among the neurons lying above the cones & rods. A number of years ago experimenters showed that glial cells don’t serve as mere scaffolding for other cells, but can actually channel light & therefore help to facilitate vision. The eyes are marvelous instruments for converting outside reality into images lodged inside our brains. A new study of the retina, the light-sensitive region at the back of the eye, solves a mystery as to why the images we see are so sharp. The light-sensitive cells in the retina -- rod-shaped cells, which can process very low levels of light, and cone-shaped cells, responsible for perceiving color -- pass their electrical signals along to neurons, lengthy cells which, when bundled together as the optic nerve, carry visual information deep into the brain. Strangely, the neurons which govern this delicate process lie in front of -- not behind -- the receiving rod and cone cells. Even though these neurons are transparent to light, their wrinkled shape distorts the light as it passes through on its way toward the rods and cones. Why aren't the neurons underneath the light-sensitive cells, where they won’t distort the incoming image of the outside world? The mystery has now been solved by explaining the role of glial cells. Glial cells perform a number of roles around the body, such as bringing nutrients to other cells or holding them in place. This is especially important for glial cells in the brain; they are sometimes referred to as the “glue" of the brain. 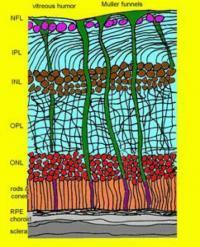 Glial cells are also present among the neurons lying above the cones and rods in the retina. A number of years ago experimenters showed that glial cells don’t serve as mere scaffolding for other cells, but can actually channel light and therefore help to facilitate human vision. Now scientists in Israel have gone the next step by providing a detailed description of how glial cells produce sharp images. Erez N. Ribak and his student Amichai Labin at the Technion- Israel Institute of Technology in Haifa, have shown how the vertically-oriented glial cells -- extending from the top to the bottom of the retina -- can funnel light through the neurons and the other layers of the retina down to the photo-sensitive cells -- the rod and cone cells -- where the light is absorbed. In other words, the glial cells are acting as light pipes for delivering visual images of the outside world into the brain. Furthermore, because of the geometry of the light-guiding glial cells, only light that comes in at a pretty straight-on direction will make it all the way down to where the photo-cells are waiting. Light arriving at oblique angles might enter a glial cell but will not be successfully guided downwards. Instead it will be scattered off to the side. This is origin of our sharp vision. Illustration: Diagram of the human retina. Outside light passes through the bulk of the eye, a material called the vitreous humor. Then it strikes the top of the retina and is channeled by glial cells (referred to in the diagram as “Muller funnels”) down to the rod and cone cells (orange color) at the bottom of the retina; there the light is absorbed. –Erez N. Ribak/ Technion- Israel Institute of Technology.